The latest format! 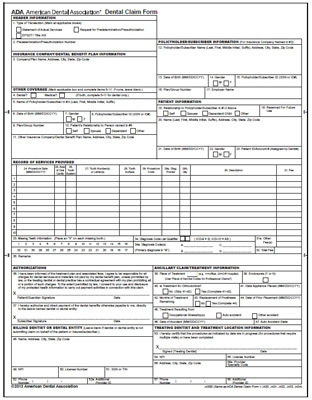 ADA dental insurance claim form with required National Provider Identifier (NPI). Ships standard ground only. Usually ships in 48 hours. These ADA claim forms are the "new" format - required by May 23, 2007. Starting May 23, 2007 providers will be required to have a NPI when transmitting electronic claims or other electronic transactions governed by HIPAA. The ADA Dental Claim Form has been updated and now includes a field for the National Provider Identifier. Starting May 23, 2007 providers will be required to have a NPI when transmitting electronic claims or other electronic transactions governed by HIPAA. Many payers will be accepting the new claim form as of January 1, 2007. We stock three different formats of the dental insurance claim form approved by the American Dental Association (ADA). What is the difference in the available formats? "Computer" forms have tear off sides and produce a duplicate copy. "Laser Sheets" are used with a desk jet or ink jet printer.